You will be given a reference e-book to read which has 200 pages And the test will be based on that e-book , you can take final test within 1 year of purchase. Thinking of a career in the field of Finance and Accounting, then one promising career is “Financial Risk Management”, for those who are new to this phrase a little elaboration will help. Financial Risk Management is both qualitative and quantitative and Basel Accords have been adopted internationally in banking sector for tracking, reporting and exposing credit and market risks. Demand for qualified Financial Risk Managers has increased manifolds in the international financial and banking sector, so if you want to take plunge in this job sphere the best practice would be to get certified and who can better help than Brainmeasures. 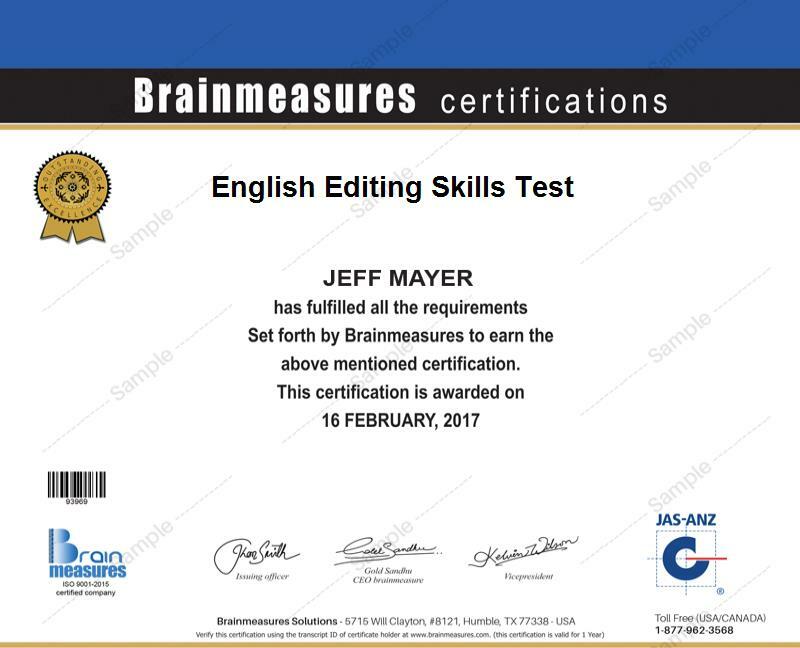 Brainmeasures is (an ISO 9001-2008 certified) online certification and skill testing company, employers worldwide honor Brainmeasures certifications when hiring new employees for their organizations. Brainmeasures Financial Risk Management Certification Course Program is an over 200 page well researched comprehensive financial risk management course helping you learn all you need to know about Financial Risk Management before entering the job market. Well researched course material developed by seasonal professionals, will help you learn all you need to know about financial risk management. Reference course has been divided into two sections for easy understanding. Section One - discusses about growth of modern financial risk management, market theory, derivatives and leverages etc. Section Two – discusses real life examples to help you understand the actual facts of the job. Detailed course written in easy to understand language for better understanding. Getting certified becomes quite easy with Brainmeasures as everything is available online just enroll in for Brainmeasures Financial Risk Management Certification Program and you will get an online course and certification exam, go though the reference course and take the certification exam, this is all you have to do to get certified. Anybody who is interested in financial risk management can enroll for this course and certification program and no prior knowledge of finance and accounting is required for this. This course is best available course for students of finance and accounting, bankers, stock traders, financial valuators, hedge fund managers, CEO and Company owners, accountants. This course will teach you everything you need to know about financial risk management. Demand for qualified and certified financial risk managers has increased manifolds internationally and thus chances of getting a job are quite high but not anyone who has little knowledge can enter the job field as even if you get a job with little knowledge you will be shown exit as it is a very demanding career, so right path would be to first have complete knowledge of the subject, get certified and then go for a job. Once certified you will have huge job opportunities in this field with sectors ranging from banking, stock broking firms, FOREX exchange, accounting firms, Investment banks, Hedge Fund corporations etc where you will work as a financial risk manager. Certified financial risk managers can expect huge salaries making this a very lucrative job, monthly salaries range from $50,000 for beginners to $100000 for seasoned financial risk mangers. According to one of sources, leading companies offer following salaries to their financial risk managers. These are just few examples, but there is no denial to the fact that this is one lucrative career to choose. If you think this is career for you then take a plunge, get certified now and live your life.